Here at Ken’s Autos, we are available to restore and service your car air conditioning. If you’d like to hear more about what this entails, or get a quote, then please get in touch. You can call our Whyteleafe garage on 0208 763 0102 or our Warlingham garage on 01883 622 069. Alternatively, please fill out our contact form and a member of our team will get back to you. 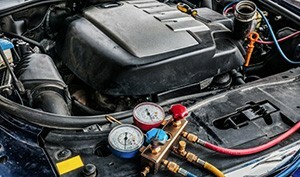 Most of us are used to using air conditioning in our vehicles, but not everybody is aware that AC requires regular servicing to keep it at its most efficient. As is true with many aspects of cars and vans, things begin to deplete over time and it’s important to be sure that everything is in working order - especially, in terms of car air conditioning, after winter as this is the time that the most gas is lost from the system. At least every two years, you should service your car air conditioning to ensure everything is in working order. This runs in line with having a regular service each year, but is not included in this process as the necessity is not as frequent. Why is this procedure so important? Being based in both Croydon and Surrey, we are perfectly placed to deal with customers from the area, including Sanderstead, Selhurst and Warlingham. So, if you’re air conditioning is due a service, get in touch. You can call us on 01883 622 069 for our Warlingham garage or 0208 763 0102 for Whyteleafe. Alternatively, you can fill out our simple contact form. Air conditioning service can be booked online. Please click the button below to book online, or contact one of our garages who will be happy to help you. If your air conditioning is no cooler then we will give you your money back.